Spring is visible from the road, it is right on the side of the road. The flow is like that of a kitchen faucet. Metal pipe sticks out of a ‘fireplace’ like structure. VERY LITTLE parking, ON A CURB. Best if you are coming from Ceasar’s Head, so you can park right in front of the spring, no parking on the other side of the road. This was my first trip to the spring, so I was going to go home and test the water. A man pulled up to fill his cup and I asked if he had stopped at this spring before. He said, “many times”. We also saw other cars parked at it on the way up to the park. 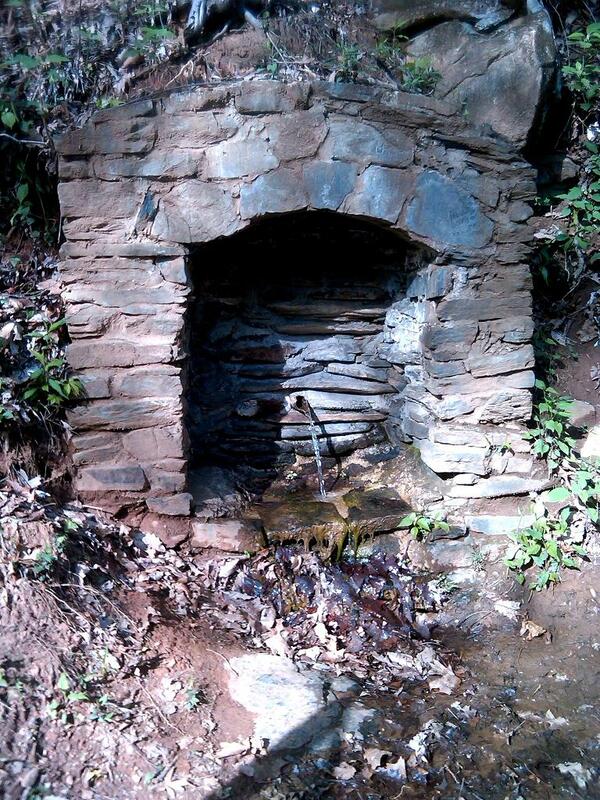 The water was cold, and had a good taste (reminded me of well water with the mineral content). Good and cold and flowing like a faucet. Filled 3 jars even made friends with a sweet little salamander friend cooling off in the water. Tastes amazing and refreshing. Visited this spring the end of 2016 around Christmas time. It was still dry from the summer, since we had no rain for over 100 days. I am curious if anyone has gone since then. I have filled jugs of water before and it tasted great, not sure if it is safe though. As of December 1, 2016 the spring is completely dried up due to low rainfall. Trying to save you a drive if you don’t live close. Wait until it rains and the spring will be flowing again. This spring’s name is actually Marchant Spring, at least according to the folks at Caesars Head State Park, near Cleveland, SC. We got five gallons today, took very little time to fill. Water tastes amazing! I’ve drunk a little bit from this spring before. It tasted good, but I have no clue how clean the water is. Filled my 40 ounce Kleen Kanteen with water from this spring. Cold refreshing water. drove to the spring today, 8/27/11, and the flow of the water was a little more than a leaky faucet.